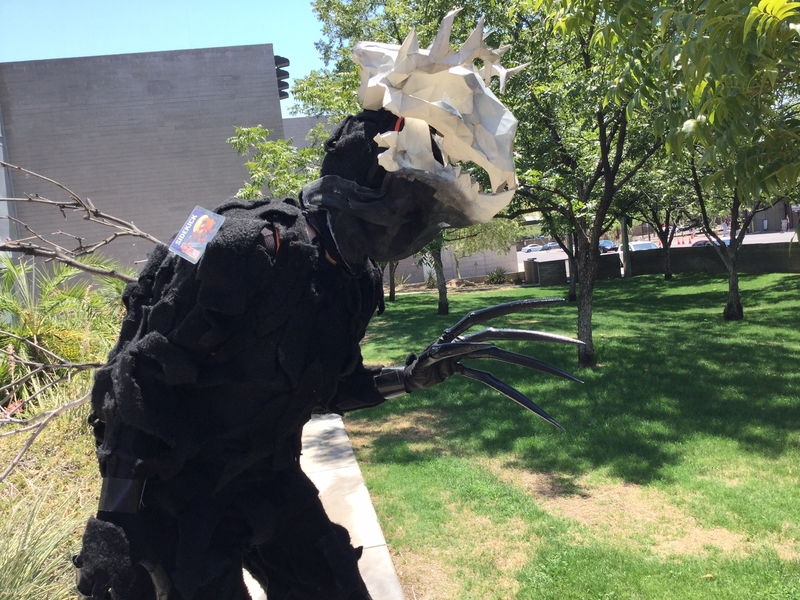 I have been working on a concept costume for the Comicon Convention in Phoenix for awhile now and this past weekend was the convention. 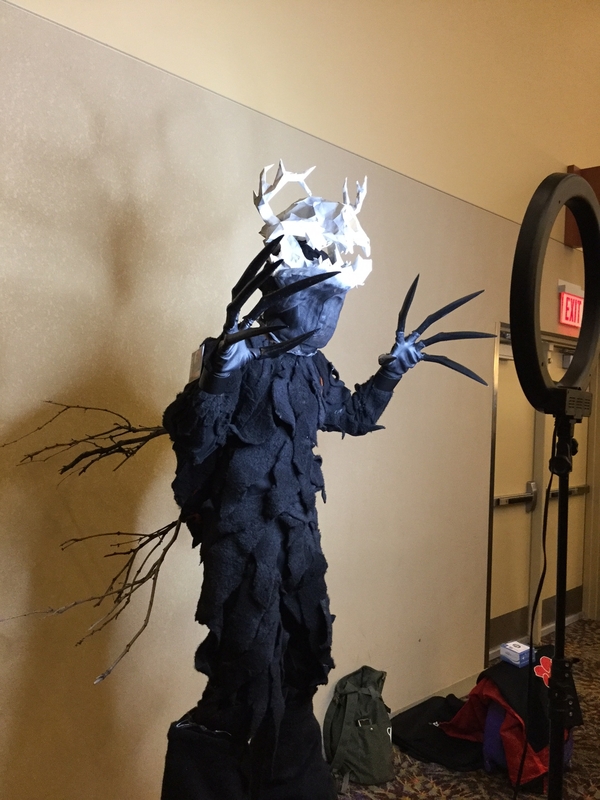 My idea for this costume was to create a stilted character that was unique using a technique that I've used in the past on other projects which utilizes the pepakura design software. I first found a head design that suited what I was attempting to achieve in my character, the characters name is the Necrostrider a spirit which has risen from the ashes of a dead forest, Necro means dead, so the "dead strider." I wanted a humanoid body paired with a canine looking skull and then add the antlers which gave me a cross of a canine/deer creature. 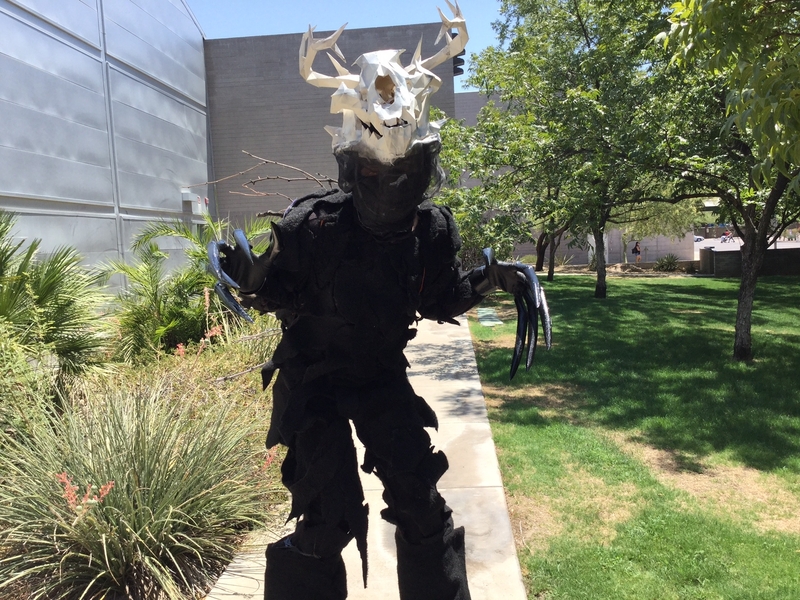 The body was made from tight black pants and a old T-shirt I glued fur onto the pants an t-shirt then left some spaces open to give it the effect that it was mangy and burnt. 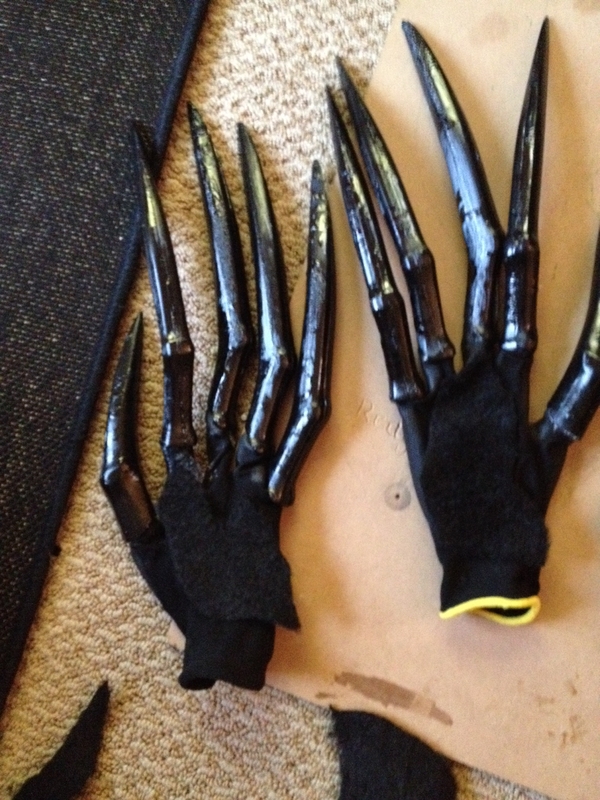 I 3d printed the talons then painted and glued them to a glove. 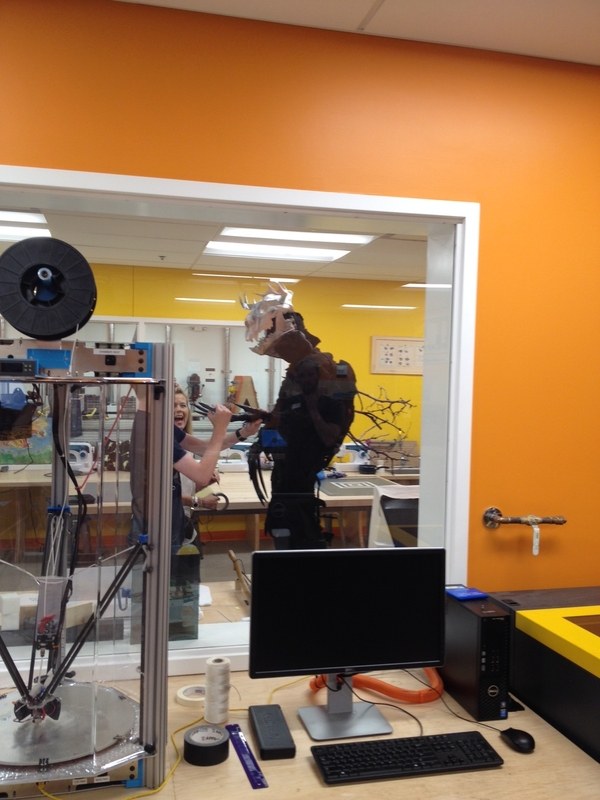 The video's below show the operation of the jaw, head and sound effect with the motion. By this, I mean that there wasn't enough physical change to make the viewer see the "creature", rather than a person wearing stilts, with a skull on their head. Granted, the pepakura paper skull was nicely assembled. 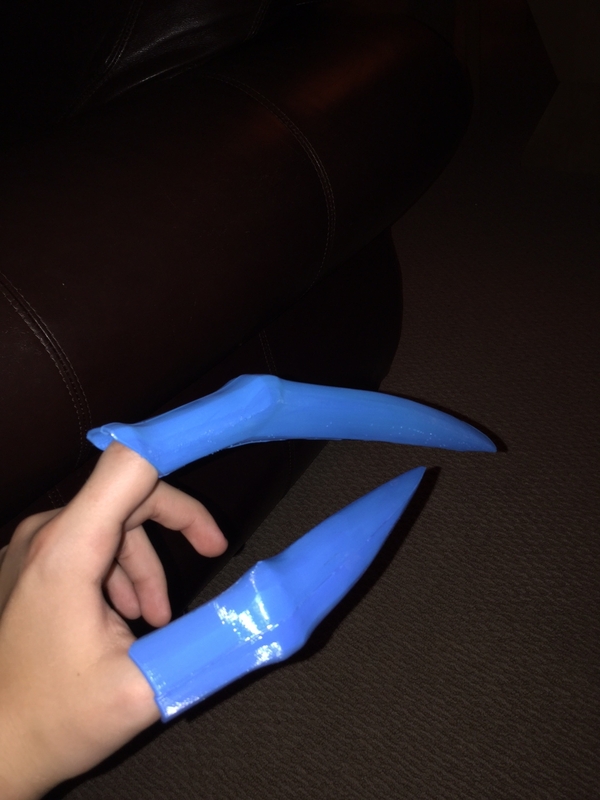 And, the 3d printed claws were an interesting idea. But, it just wasn't enough. The skull is in much need of shading and characterization, with the judicious use of a little color, (i.e. : burnt sienna, raw umber, terra cotta, and red iron oxide). Just enough, to keep the detail visible from a distance. But, in regards to the body of the performer, it was too painfully obvious it was a human body. Through the use of readilly available and inexpensive items, (such as pool noodles, 1/2 inch appolstery foam, spray paint, rit fabric dye, and acrylic paints, and cheesecloth or "monk's cloth"), I would advise trying to change the outward shape of the body. Maybe give it a hunched over back, with exposed ribs. For the legs, obtain the lower half of a "ghillie suit", (you can find plenty of pictures and places where you can even purchase them relatively cheaply, or you could even make them. 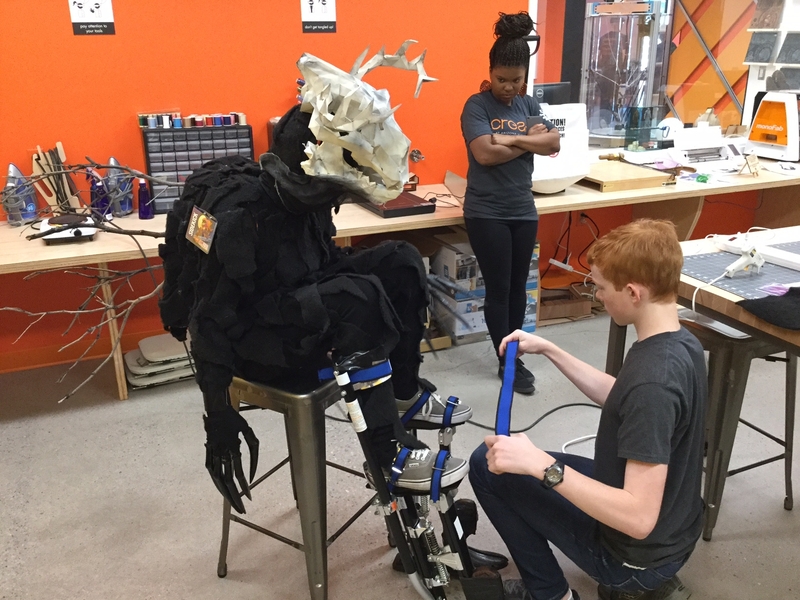 ), this would at least help make the legs look less human. 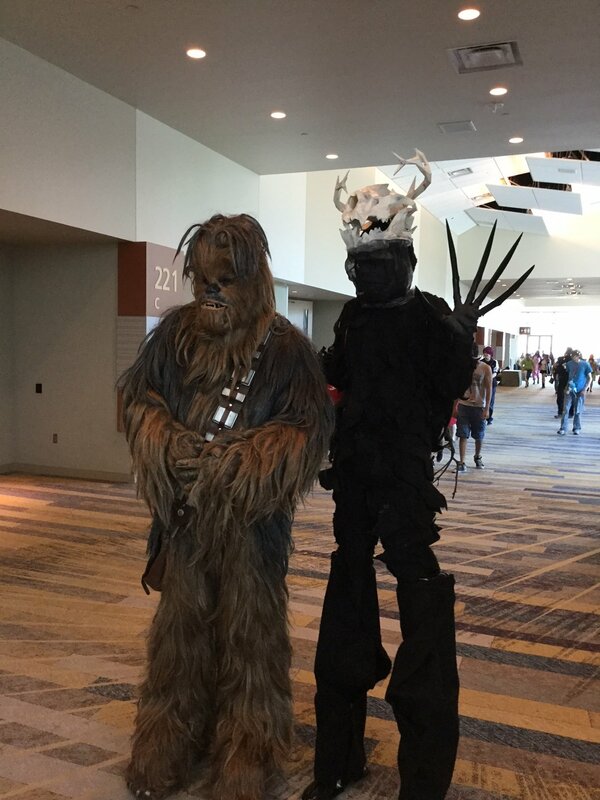 Also, it is important that when creating a non-human character or creature that your human performer is completely covered by the costume. Regretably, your performer's pale white neck is exposed in most of your photos and video footage. Basically, anything you can do to break up the overall silhouette, and make it less human-looking, the better! I liked your idea for how to provide some sound for your creation. But, I think it would be greatly enhanced by a much more unrecognisible roar. There are several free and/or inexpensive sound recording and mixing programs available. Even the basic audio programs that come with your computer, (pc or mac), will do quite well for these purposes. You should record at least three to six UNIQUE audio samples, and mix then together into something awe-inspiring, and truely bone-chilling. In regards to your initial concept, (which I like quite a bit), it immediately reminds me of the "monsters" in the movie, "The Village", and also a little of the legends of the Algonqiun Native Americans, regarding the "Wedigo". At least in "spirit", (ahem). While I understand that this all might sound daunting, and possibly expensive, you would be surprised at how little it would cost you to greatly improve your costume. And, with a little more thought and effort, you can create something that can be VERY AMAZING!!! Wow Jeffery! Thank you so much for your insight and input! 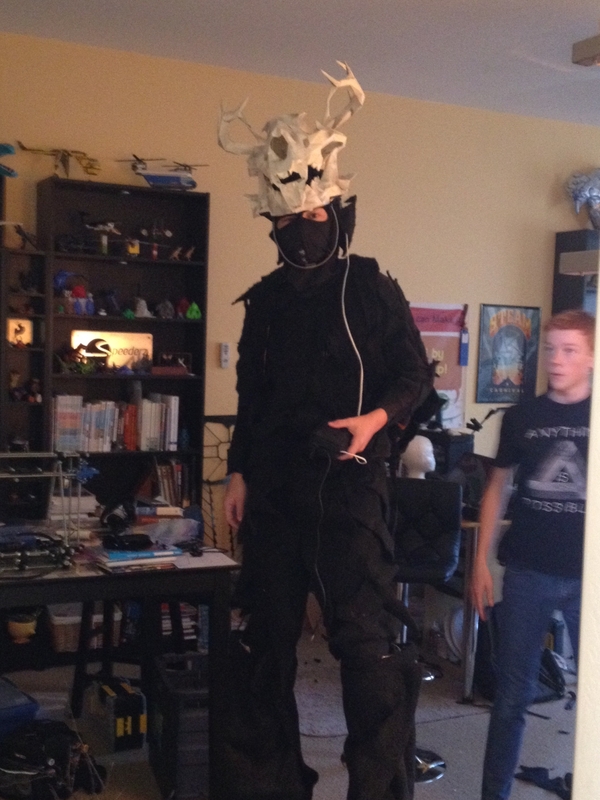 I am 12 yrs old and plan to create and build more creatures. Many of your ideas will help improve my costume for Halloween. Thank you Stan Winston for this opportunity to collaborate and build upon each others ideas. I honestly think you have some good ideas here, and I'd really like to see how far you can push them, to create something really spectacular!!! It does not need to be expensive, though. It does require some serious thought on your part, (and a little "elbow-grease" helps, too). Sit down with some printouts of the photos of your current "creature", and some tracing paper. Overlay the tracing paper, on your photos and draw out what you would ultimately like your creature to look like. DO NOT DO THIS IN THE COMPUTER, with a program like Photoshop!!! This is on purpose, when I tell you this. You will learn far more, at this point, doing it the "old-fashioned" way. If you THINK you can't draw, you just haven't really tried. (If you CAN draw, then you are just one more step ahead of the game.) Everyone has the ability to draw, if they try hard enough!!! Most people never try, they usually just give up, and claim they "CAN'T". But, I digress... I want you to sketch out no less than three-to-five completely different variations of your creature on the tracing paper. DO NOT worry about them being perfect. Tracing paper is cheap. And, if you mess up any part of your design, it is easy to trace the good parts onto a new sheet, and continue drawing. Keep in mind these are SKETCHES, in order for you to create your best design possible. They SHOULD BE ROUGH. They are NOT intended to be your FINAL drawings. If you would, it would be great if you would post them here, so we can all see how you are doing. You should concentrate on shape, form, and silhouette. DO NOT concentrate on detail, and texture! If you do not have good shapes, forms, and silhouettes, then NO amount of detail and texture will matter. Once you have these sketches you can then scan them and post them, (or if you do not have access to a scanner, place each one over a white sheet of paper, and photograph them, and post). If you do at least this much, I will gladly help you take your design(s) to the next stages. But, it is important that you do this. Trust me. Also, a good book for you to read is, "Drawing on the right side of the brain", by Betty Edwards. No matter what your skill level at drawing is, this will greatly improve your work. Either borrow it from your local library, or ask your family to get it for you for your birthday, or a holiday. It is well worth having and learning from! Hi Jeffrey! I'm taking on your homework assignment. The concept for my original design, Necrostrider is a spirit that rises from the ashes of a dead forest. Confidently stalking through the forest. I have printed out my costume pictures, I have tracing paper in hand and will post pics of how it evolves. Thank you for coaching me to make my vision come to life. Stay tuned!